I'm always interested to hear how other people see Paris, so I was very happy to be contacted recently by the publishers of a new book on the city. For some people Paris is defined by its architecture whilst for others it is written out in the pages of a book, but for writer Michael Schurmann, the city is one large film set. So great is his passion that he has dedicated much of his recent life to the creation of a series of 'movie walks' which take the visitor through circuits of some of the key film locations in the city. Interested by his passion and his unusual perspective of the city, I was fortunate this week to chat with him and get a personal tour of his Montmartre neighbourhood. Originally from Germany, Schurmann spent several years working in London, notably with the BBC World Service before a company takeover eventually brought him to Paris. He worked for several years at Eurosport as a commentator, mostly for American sports, but today divides his time between writing and freelance translation. 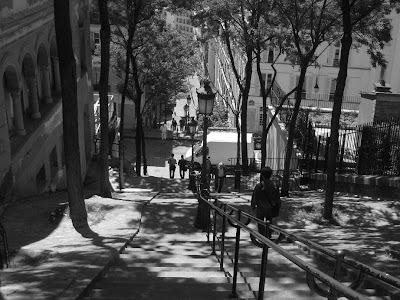 Always a film buff, his passion grew as he got to know the city better, and today he lives on the almost permanant film set which the Montmartre hill has become. As soon as we leave his front door he is immediately able to point out the locations of two films and the previous apartment of one of France's top directors. The staircase leading down to the Au Soleil de la Butte café, both featured in the 1995 remake of Sabrina. "All the books on the subject say that the entire movie was shot on a Hollywood sound stage, where the original settings were more or less faithfully re-created, but if you compare the view you're seeing (here at the top of the staircase) with the film's final tableau, the similarities seem too striking to believe that we're merely seeing a recreation in the film"
A key location in 1998's Ronin. As we walk we chat, and I point out to Schurmann that creating a successful walk is a little like producing a successful film; it needs to have a good beginning and end, and not to lose people in the bits between. He agrees, but points out that by following a movie walk in Paris people are unlikely to ever get bored or find their attention drifting. For American audiences, Paris is always used for a reason, and when Paris is chosen as a location it becomes one of the biggest stars in the film. To use it against type and send audiences to some non-descript corner of the 15th arrondissement for example would be like using Brad Pitt in a film and only giving him a walk on part. Why go through the trouble and expense of using this star if you don't then give audiences what they want? For this reason, almost all the locations described in the book are picturesque and often feature key touristic sites. A case of life imitating art. 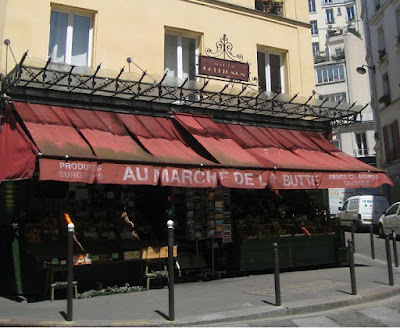 The epicier featured in Le Fabuleux Destin d'Amélie Poulain was rendered 'more authentic' for the film, but the store owner has kept it in exactly the same condition since. I ask Schurmann if there is there any film though that has taken the risk to use the city against type, and he thinks hard. The answer he gives is also his favourite film set in the city; The Bourne Identity. He calls it 'an andidote to the saccharine that's an occupational hazard for people who watch too many movies about Paris'. This is not Roger Moore fighting Grace Jones on the Eiffel Tower, but Matt Damon hiding out in a no star hotel in a forgotten corner of Belleville. All of the locations used are logical and realistic and as Schuermann says, 'give you a real feel for the city'. It is featured in no less than seven of the ten walks in the book. Schurmann is not a frustrated director or screenwriter, but just somebody with a genuine passion for film. I'm even surprised to learn that he would not particularly be interested in working as a location hunter. 'Can you imagine how difficult that job would be in reality?' he asks. 'Sure Paris is a dream city for making films, but how do you find locations that haven't already been used twenty times before? You need to incorporate recognisable sites, yet find angles that are completely new'. Perhaps Paris will one day become the faded star, the actress who appeared in too many films and who began to bore the audience. Schurmann thinks this unlikely given the fact that the city authorities are so helpful to film makers and because the city itself is just so adaptable. 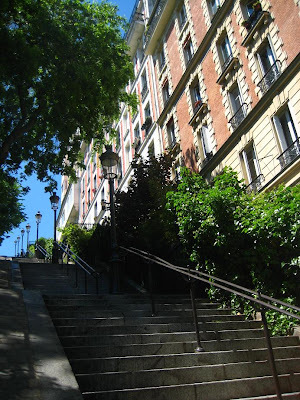 As we walk along the top of Rue Lepic, my guide explains that this street was used at the beginning of La Vie en Rose (Piaf). 'It's so easy to make this street represent any era' he explains. 'For this film they just had to put up a few old posters, put the extras in costume and find a horse, and it is immediately the beginning of the 20th century'. However, he does have many examples of films that were supposedly set in Paris but in reality were filmed in other, cheaper cities, with Budapest being a particularly popular alternative. Paris Movie Walks by Michael Schurrman is available from Amazon in the US, and will be published in the UK in August. How *totally* cool! As an architect, movie buff and Paris-fanatic, I will have to get Schurrman's book. This reminds me of the literal "frisson" I experienced during a recent viewing of Agnès Varda's "Cléo de 5 à 7" (a Paris "road movie" mostly on foot!). There's a scene where the 2 main characters are on a bus going by la Place d'Italie. The camera pans across the front of a wonderful brick (Adam!) public pool building, a kind of storybook / Romanesque creation with a wavy roof and eccentric details. I took pictures of this place last November because was so eye-catching. I'm not that passionate about film either, but if I learn that a film was shot in Paris, I make a point of seeing it. ArtSparker: I'm sure there could be film tours in San Francisco too, but if I ever go there (again - I went when I was 6! ), it will be for a Mark Eitzel/American Music Club tour! Margeret: You are teaching me things about Paris! Not the swimming pool (which will be featured on my bricks blog soon!) but the film and the tea room. I've just looked at the book again, and that film isn't covered, so you'll have to suggest it for the (in good film style..) part 2 of the book! In the meantime, I'll check out the tea room too. Starman: Thanks for that link. Incredible the number of films that are made on the spot, many of them of course becoming less famous than the ones you generally refer to! 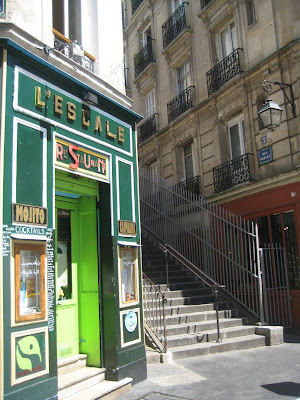 While you're there, you could walk up the rue to L'Oisive Thé and say "Bonjour" to Aimee. Ooh, please say "Hi" to Aimee on my behalf as well. Perhaps we'll see a post about l'OisiveThé on Spotted By Locals? Even though film isn't one of your main interests, I really recommend you see "Cléo de 5 à 7". Absolutely beautiful B&W verité footage of Paris in 1962, shot with a fluid wandering camera ... the story addresses life, death, despair, hope -- also hat buying and pop songs. So French! The Criterion Collection put out a gorgeous DVD version with lots of extras. I don't know if this is available in your DVD format. Thanks Margeret - two things I will definitely do. When I do watch films, I always prefer the older ones, as not only are the stories often more interesting and challenging, but they also give me the chance to observe some history too! I'm sure I'll spend more time looking at the backdrops to the scenes, but I'll make sure I hunt down the film soon! Anyway, thanks for sharing so much info, I'll be back! Do you know if this book covers the filming of The Count of Monte Crisco? Was any of it actually filmed in or around Paris? Hello Harriet: I asked Mr Schurrman and he said that it is not included in this edition. However, he said he may be able to give more information if you can say exactly which version you are interested in.